NIHRAC was represented at the Preparedness Summit in Atlanta in April 2015. This event, sponsored by the National Association of County and City Health Officials (NACCHO), gathered over 2000 public health and emergency management professionals from across the country and foreign nations. The event had a number of amateur radio activities, including a session on amateur radio technologies for emergency support, a license test preparation class for new and aspiring hams, an amateur radio exhibit boot, and a especial event radio station. The event also offered a license test session, which allowed around 14 hams (roughly half of those who took the exams) to obtain or upgrade their FCC licenses. The NIHRAC representative, W3CID, presented about Winlink 2000 and BMERS, supported the test preparation session, and provided log support during the operation of the N4P especial event station at the Georgia Tech Amateur Radio Club. N4P made over 900 contacts, which included stations in all 50 states and 35 countries, in 4 fun evenings of amateur radio good-will communications. The worked stations also included W6RO (the R.M.S. Queen Mary station in Long Beach), several Emergency Operations Centers, W1HQ (the ARRL HQ Station) and other remarkable stations. The special event station advertised operations in several bands and Echolink, but most contacts were in the 20 Mts band. The GATech Amateur Radio Club graciously allowed Summit hams to use their equipment, which included a YAESU MARK V FT-1000MP transceiver, a 1000 W linear amplifier, and a 4-element 20M beam, among others. 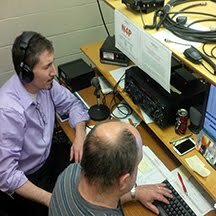 The Summit was also the inaugural event for the recently-created Public Health Amateur Radio Club.